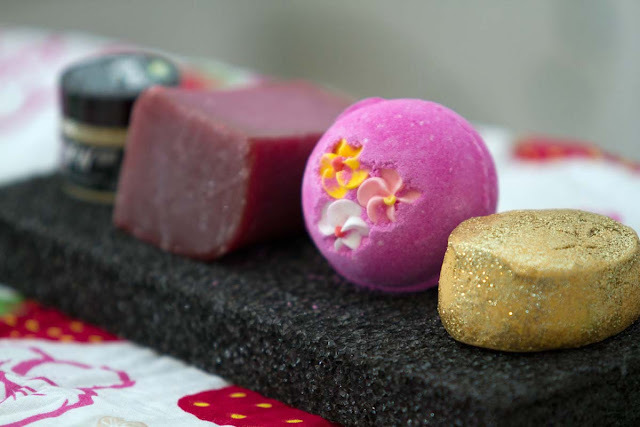 In the most delightful way: Lush Gifts. Hi guys this is just a quick post to share with you some lovely Lush treats that Hubby gifted me with at Christmas. 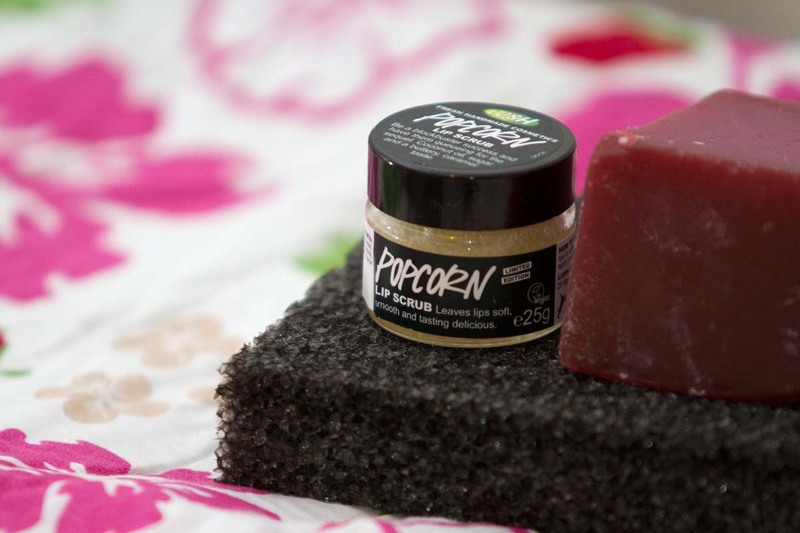 So I received 4 Lush products from Hubby in total; Popcorn lip scrub, The Godmother soap, Think Pink bath bomb, and Sunnyside bubble bar, which were all lovely. This is the first time I have ever tried a lip scrub, to be honest I have always thought them to be a bit of a waste of money. I mean surely it will just do what you can do with your toothbrush, and to some extent that is the case. It does remove the dead skin just like brushing your toothbrush across your lips will do, but I am not too keen on the idea of little bits of dead skin hiding in the bristles of my toothbrush. Eww that mings me out! So this product for me is a real winner. Also it smells AMAZING. It does have that undeniable popcorn scent, if not just a little sweeter. Hubby actually bought this and The Godmother specifically because they smelt so good. As for application, it was really easy to use. I took a pinch of the product between my thumb and first finger and then massaged this across my lips until they were sufficiently smooth. It does say to then lick the product off your lips but I prefer to get my sugar fix from a chocolate bar instead, so I just washed this off with water. For those lipstick loving ladies or those with chapped lips (and do not like exfoliating with their toothbrush) this might be the product you have been looking for. 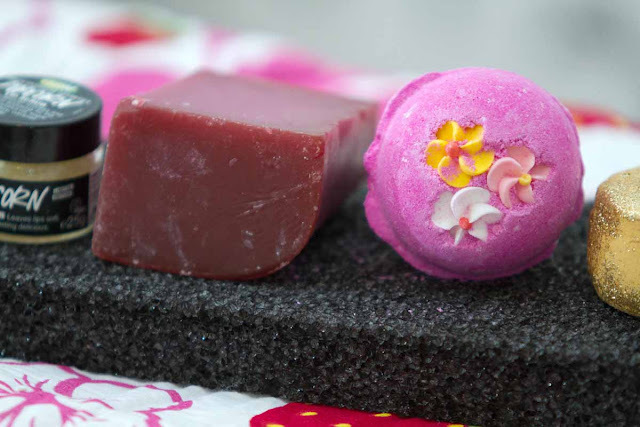 This soap comes in the solid/block form that Lush is renowned for and like the lip scrub, smells so good. I use this with a scrubby sponge (to get a little exfoliation as well) and it is pretty long lasting too. This bath bomb is super cute. It has a strong scent when I smelt the bomb itself but once in the bath it weakens to a soft, subtle scent. Also when the bomb started to dissolve it left a beautiful pink ombre effect in the water, which was then ruined by me actually getting in the bath! However all was not lost, it still left me with a bath full of pink water with little hearts floating around in it. This is a bubble bar with a warm, comforting scent, covered in gold glitter. Who doesn't want that? It also left a gold film around my bath when the water was drained. I'm not sure if that is a good or a bad thing, but it looked pretty good!. All in all some lovely presents. 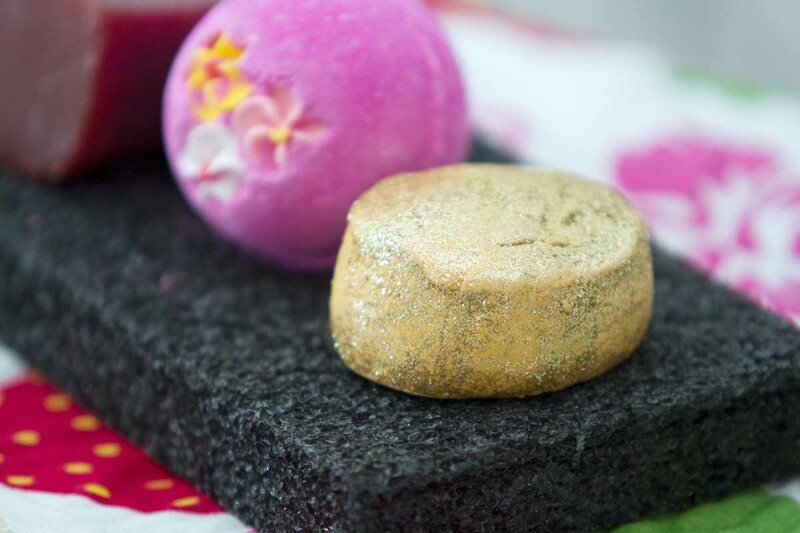 For me you definitely can't go wrong with a bit of Lush.